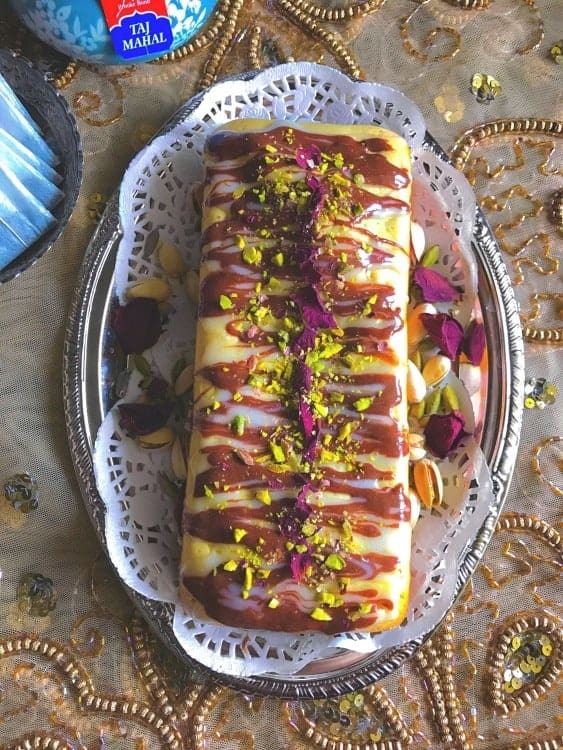 Cardamom, Pistachio, and Rosewater Eggless Cake: Moist and delicious cake infused with rosewater – cardamom flavor with a marble glaze and chopped pistachio. 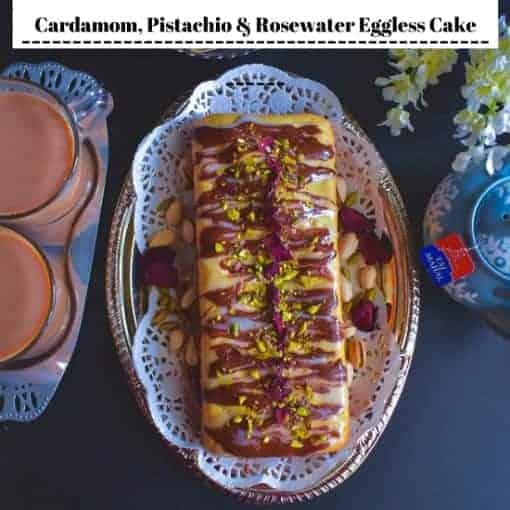 Cardamom, Pistachio and Rosewater Eggless Cake (using Yogurt) is a lightly flavored and a perfect companion to a hot cup of tea/coffee or parties. Hey Everyone, as you’ll know we have the ‘ICC Champions Trophy 2017’ going on and we are celebrating each game with friends and family and this special Cardamom, Pistachio and Rosewater Eggless Cake. Team India qualified for the semi-final round!!!! 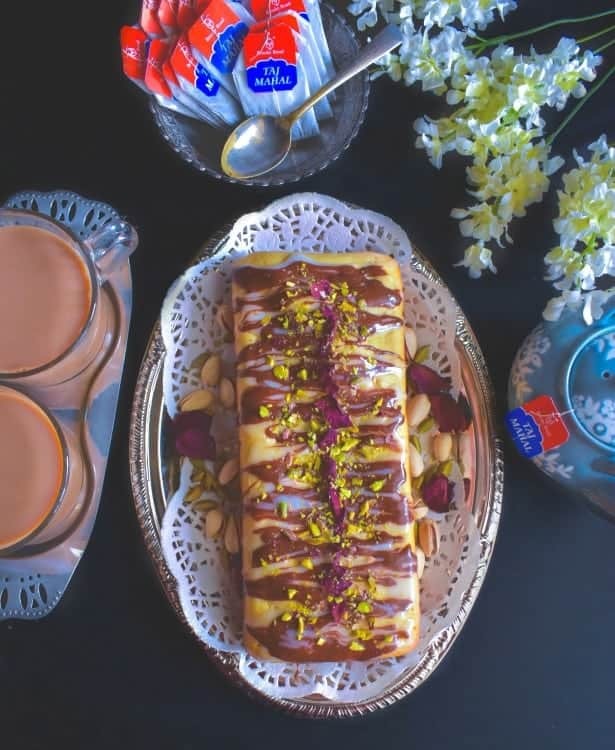 So, we have decided to celebrate our next cricket watching session with Brooke Bond Taj Mahal Tea and this Cardamom, Pistachio and Rosewater Eggless Cake . 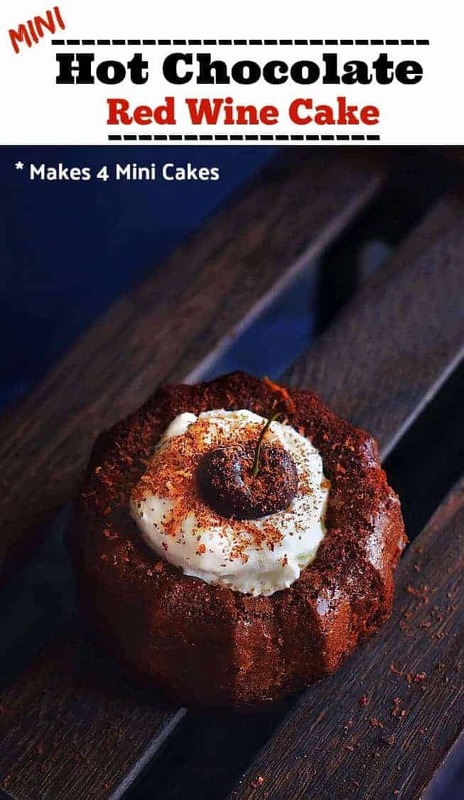 The cake is one of our absolute favorites because of its fragrant – light flavor that goes fantastically with a hot cup of tea…..
I’m not talking just about any tea, but India’s finest ‘Brooke Bond Taj Mahal Tea’ which is famous for its exquisite aroma and superior taste. I’m also glazing (icing) the cake in a marble design using icing sugar and chocolate and a sprinkle of thinly chopped pistachio. or these delicious delights ‘Spicy Mexican Poppers’, Chutney Cheese & Jam Herbs Tart Platter, Masala Naan Canapés from my friend Sonal. In all of our previous cricket parties, we have been noshing heavily on savory dishes and this time, the ladies have decided to each brings some sweets too and I’ve been assigned to get a cake. 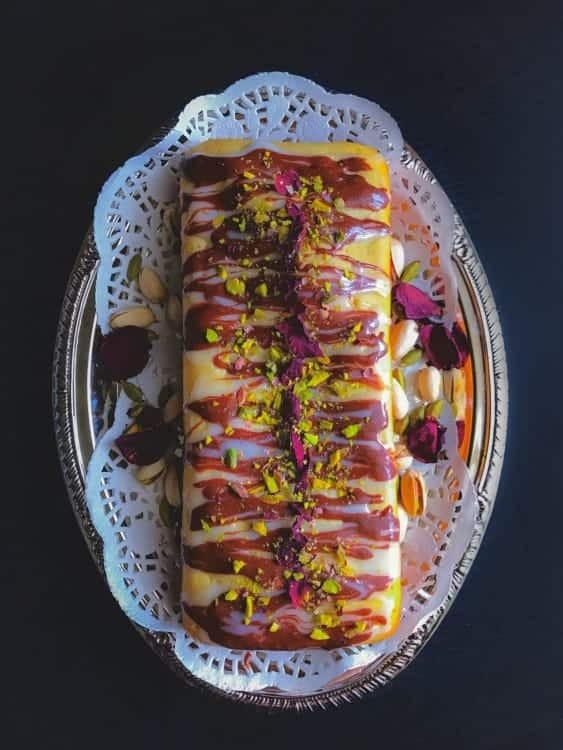 As I mentioned above, I’m going to make this gorgeous looking Cardamom, Pistachio and Rosewater Eggless Cake – which is reserved for special occasions. 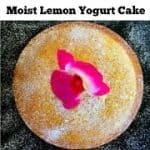 The cake is super easy to make and doesn’t involve any heavy cream based icing hence it is perfect for tea or parties where we are usually doing finger-food/light dishes. Since we are including rosewater in the cake, I also added some dried rose petals which make it look so exotic. Also, since many of our friends are vegetarian/vegan, I’m making an eggless version this time. 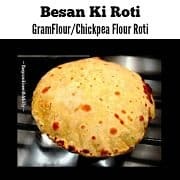 If you’ve never made an eggless cake, then this is a great recipe to try as it’s a small quantity and yields a moist cake. To make the eggless variety, I’m using a vegan brand plain yogurt instead of eggs. The yogurt is store-bought, however, you can use homemade yogurt too. But the only thing to remember is that the yogurt should be ‘plain’ as we will be infusing it with cardamom and rosewater later. Also, as I mentioned above, I’m adding some crushed dry rose petal on top once I’ve glazed the cake. The rose petals add such a beautiful touch to the whole cake, however, if you don’t have dried rose petals, you may simply skip the step for this time. If you’d like me to tell you about making dry rose petals at home, then do let me know and I’ll create a separate post about it. And go ahead and make this delicious Cardamom, Pistachio and Rosewater Eggless Cake for your next cricket party. And cheer for your team along with a hot pipping ‘Taj Mahal’ tea and don’t forget to say “Wah Taj” ! Moist and delicious cake infused with rosewater - cardamom flavor with a marble glaze and chopped pistachio. 1/2 Tsp Vanilla Extract or Green Food Color for Pistachio color. In a bowl, sieve together flour, baking powder, baking soda, salt and keep aside. Take a large bowl, add oil, sugar, yogurt, water, vanilla extract and whisk for 2 minutes to form a smooth batter. Using a spatula, fold 1/4 Cup dry ingredients to the whisked batter. Follow the above step to mix rest of the dry ingredient to the batter. (Please fold the dry ingredients slowly to incorporate air. This will result in lighter and fluffy cake). Pour the batter into the baking pan and bake for 20 minutes. After 20 minutes, poke a toothpick into the center of the cake and remove instantly. If the toothpick comes out clean, it means the cake is cooked completely. Remove the cake from the oven and keep on a cooling rack for 10-15 minutes. 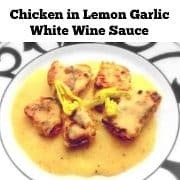 In a medium bowl, add powdered sugar with 2tbsp of milk and whisk to form a smooth paste like consistency (remember it should be thick and easily poured).? Divide the icing in two smaller bowls. Add cocoa powder to one bowl and whisk to form a smooth paste. Now drizzle both the layers on the cake to form a marble look. Sprinkle with chopped pistachio and dry rose petals. 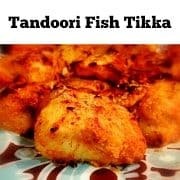 Serve Fresh or store in air tight container in fridge upto 3-4 days. 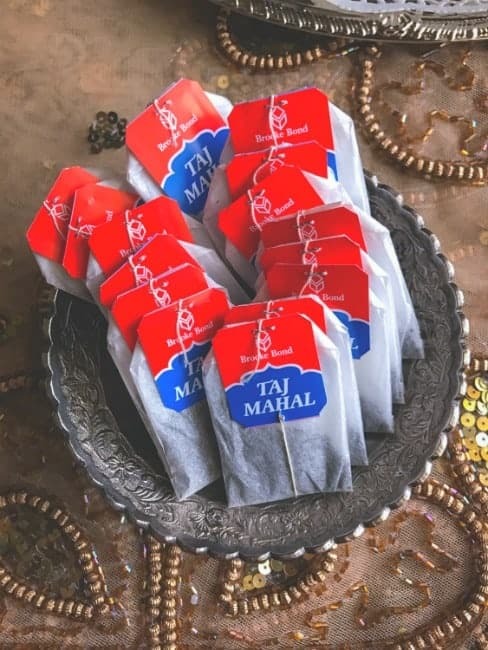 Now for a fun and exciting part, our favorite ‘Taj Mahal’ tea is holding sweepstakes – Wah Moments! You guys can all take a shot, or many shots (1 entry per day is permitted) to win a Trip for 2 to Hawaii ! There are many more exciting prizes to be won as well! 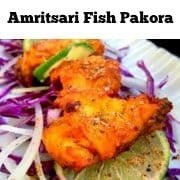 What’s more, if you’re around any of the following stores, you must go to pick up the ingredients for this recipe over the weekend! 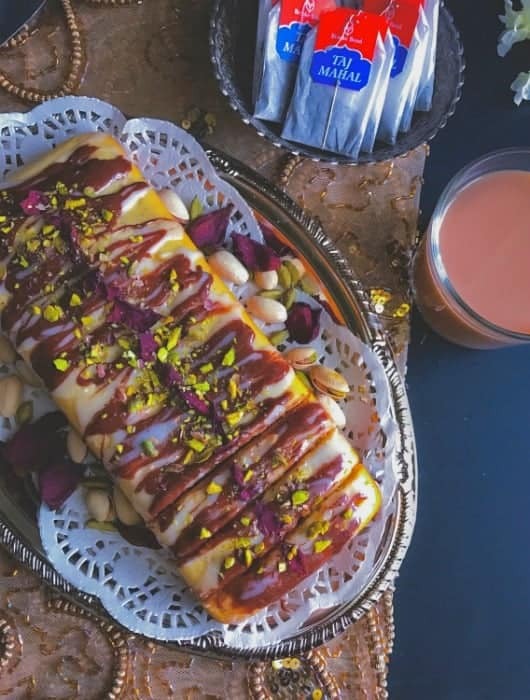 14 Replies to "Cardamom, Pistachio and Rosewater Eggless Cake (using Yogurt)"
Hi Amy, thanks so much for trying the recipe and so glad you’ll liked it. I dint do any icing to keep it light & chocolate-less. Hi, Which brand of rose water do you use? Dabur? Thanks. Hi Lari, Yes I have used various brands on different occasion (made this so many times now)…I do use Dabur and also Nielsen Massey Rosewater. Does just 1 tsp of rose water gives the taste to the cake or can v increase the quantity? I feel you that there is no rose water or pistachio incorporated in your cake batter even though you have mentioned in your ingredients section. Let me no the exact recipe. What a wonderfully fragrant and rich cake, Molly! Bravo!